Lionsgate unleashed the first glimpses of "The Hunger Games: Mockingjay - Part 1" on Thursday, including the introduction of Julianne Moore as President Alma Coin. 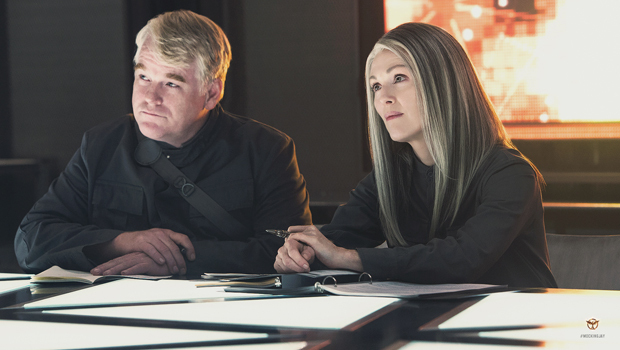 The studio released a video interview with Moore and photos of her in character, including one with the late Philip Seymour Hoffman, who returns as Plutarch Heavensbee in one of his final performances. All these tidbits were unveiled to fans on TheHungerGamesExclusive.com, which also has an excerpt from the script, interviews with director Francis Lawrence and producer Nina Jacobson and the now-standard "motion poster" showing a fiery mockingjay.